1 Select two or more objects, choose Window > Show Pathfinder, and select Trap from the palette’s pop-out menu. 2 In the Thickness text box, enter a stroke width of between 0.01 and 5000 points. Check with your print shop to determine what value to use. 3 Enter a value in the Height/Width% text box to specify the trap on horizontal lines as a percentage of the trap on vertical lines. Specifying different horizontal and vertical trap values lets you compensate for on-press irregularities, such as paper stretch. Contact your print shop for help in determining this value. The default value of 100% results in the same trap width on horizontal lines and on vertical lines. 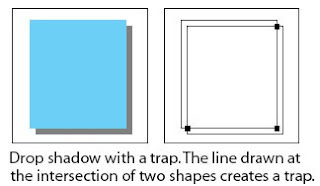 To increase the trap thickness on horizontal lines without changing the vertical trap, set the Height/Width value to greater than 100%. To decrease the trap thickness on horizontal lines without changing the vertical trap, set the Height/Width value to less than 100%. 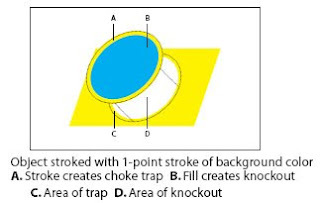 4 Enter a Tint Reduction value to change the tint of the trap. The default value is 40%. 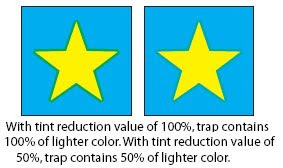 The Tint Reduction value reduces the values of the lighter color being trapped; the darker color values remain at 100%. The Tint Reduction value also affects the values of custom colors. 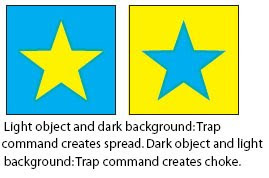 • Traps with Process Color if you want to convert spot color traps to equivalent process colors. This option creates an object of the lighter of the spot colors and overprints it. • Reverse Traps to trap darker colors into lighter colors. This option does not work with rich black—that is, black that contains additional CMY inks. 6 Click OK to create a trap on the selected objects. Click Defaults to return to the default trapping values. 1 Select the topmost object of the two objects that must trap into each other. • Create a spread by entering the same color values for the Stroke as appear in the Fill option. You can change the stroke’s color values by selecting the stroke and then adjusting its color values in the Color palette. This method enlarges the object by stroking its boundaries with the same color as the object’s fill. • Create a choke by entering the same color values for the Stroke as appear in the lighter background (again, using the Color palette); the Stroke and Fill values will differ. This method reduces the darker object by stroking its boundaries with the lighter background color. 3 Choose Window > Show Stroke. 4 In the Stroke palette, in the Weight text box enter a stroke width of between 0.6 and 2.0 points. A stroke weight of 0.6 point creates a trap of 0.3 point. 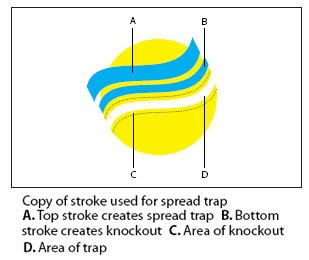 A stroke weight of 2.0 points creates a trap of 1.0 point. Check with your print shop to determine what value to use. 5 Choose Window > Show Attributes. In a spread, the lighter object traps into (overprints) the darker background. In a choke, overprinting the stroke causes the lighter background to trap into the darker object. 1 Select the line to be trapped. 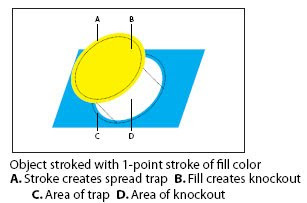 2 In the Stroke box in the toolbox or the Color palette, assign the stroke a color of white. 3 In the Stroke palette, select the desired line weight. 4 Copy the line, and choose Edit > Paste in Front. 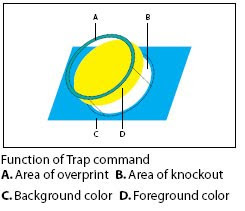 The copy is used to create a trap. 5 In the Stroke box in the toolbox or the Color palette, stroke the copy with the desired color. 6 In the Stroke palette, choose a line weight that is wider than the bottom line. 7 Choose Window > Show Attributes. 8 Select Overprint Stroke for the top line. 1 Draw a line along the edge or edges that you want to trap. If the object is complex, use the direct-selection tool to select the edges, copy it, and choose Edit > Paste in Front to paste the copy directly on top of the original. 3 Choose Window > Show Attributes. Why colors sometimes don’t match?